Vancouver, B.C……..Corvus Gold Inc. (“Corvus” or the “Company”) - (TSX: KOR, OTCQX: CORVF) announces the first drill results from the Company’s 2013 phase 1 drill program on its new Yellow Jacket high-grade gold-silver discovery at the North Bullfrog Project, Nevada. Hole NB-13-344 represents a 120 metre step out to the north of the previously defined 2012 high-grade discovery (NR12-14, May 23, 2012). 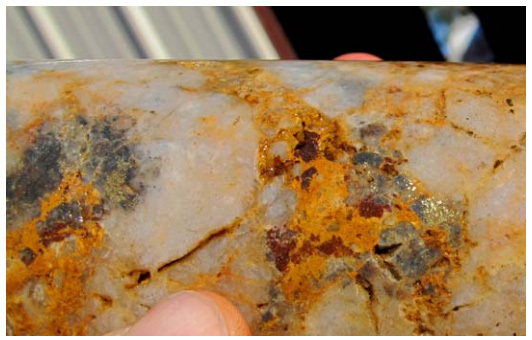 A select prioritized section of hole NB-13-344 which intersected vein material with visible gold averaged 10.7g/t gold and 10.4g/t silver over 8.3 metres, including 1.2 metres averaging 50 g/t gold and 36 g/t silver (the remainder of the drill hole assays are pending). In addition, hole NB-13-341 which represents a 70 metre step out to the north of the 2012 discovery returned 0.85g/t gold over 46 metres within an overall interval of 116 metres of 0.6g/t gold (Figure 1). These results show the continuity and geometry of the Yellow Jacket zone and along with ongoing drilling that has intersected broad zones (+50m) of stockwork and multi-stage veining as far north as has been drilled, highlight the zones expansion potential. To date 9 core holes on the Yellow Jacket “High-Grade” target and 7 reverse circulation (RC) drill holes on the North Sierra Blanca “Starter Pit” target have been completed as part of the initial 20,000 metre phase of the North Bullfrog 2013 drill program (~80 hole program). At Yellow Jacket, the alteration signature of the broad, ~1 g/t gold, vein system discovered in 2012 has been intersected in all of the holes drilled to date which represents a +200 metre extension to the north. At the North Sierra Blanca target, broad zones (+50m) of strong mineralization related alteration have been intersected in all of the drill holes drilled to date which are on 100 metre centers and represent approximately a 500 meter step-out from the previously defined Sierra Blanca resource. The 2013 drilling program results to date are providing strong encouragement for a possible resource expansion which will be completed at year end following this phase of drilling. Figure 1: Location of 2013 Yellow Jacket diamond drill holes. Red traces indicate 2013 holes completed to date. Section A-B is shown in Figure 2. For a more general location of Yellow Jacket see Figure 3. Hole NB-13-341, which encountered 116 metres of 0.6 g/t gold, and drill hole NB-13-342 were drilled to determine the geometry of the stockwork mineralization previously identified in NB-12-127 (Figure 2). 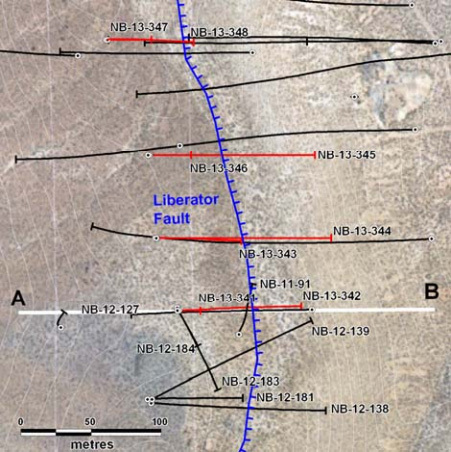 The results show that a broad zone of stockwork mineralization is focussed in the Middle Sierra Blanca Tuff unit where multiple faults interact to form a horst like structure. Holes NB-13-343 (pending) and NB-13-344 define a section similar to that shown in Figure 2. 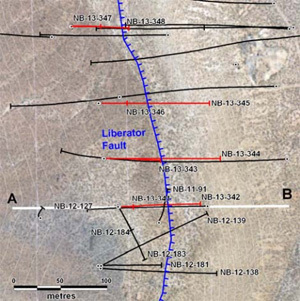 In NB-13-344 visible gold was recognized (Figure 3) in the core and as a result a 24 metre interval was rushed for assaying. This confirmed the high grade veins in the zone with two intervals running greater than one ounce per tonne gold (Table 1). In this hole, visible gold is frequently associated with silver sulphide similar to drill hole NB-12-138 drilled 120 metres to the south within the some structural zone. Table 1: Significant intercepts* from 2012 & 2013 core holes. Figure 2: Section through drill holes NB-13-341 & NB-13-342 illustrating distribution of stockwork veining in this area. Figure 3: NB-13-344 @ 124.75m: visible gold. Figure 4: Generalized location of Yellow Jacket in the North Bullfrog project area.